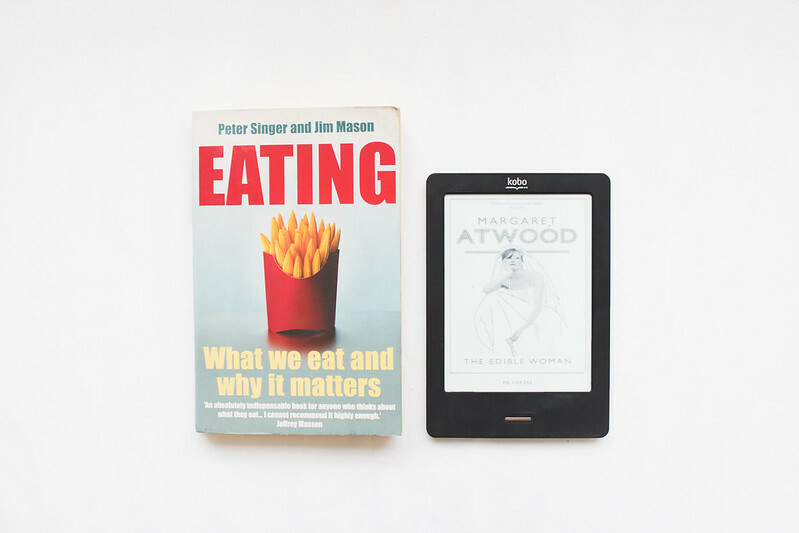 I've read countless books on the food industry and I don't think I will ever get bored of the subject; Eating by Peter Singer and Jim Mason takes a different approach to exploring our eating habits by following three families including indifferent omnivores, compassionate carnivores, and devoted vegans. The most interesting aspect of this book was the chapter on "Eating Locally," discussing whether buying locally grown produce is better for our environment (as would be assumed) or worse. The results are surprising. Margaret Atwood has become one of my absolute favourite authors yet I didn't quite warm to The Edible Woman as I have with her other books. The story follows Marian who, as soon as she gets engagement to Peter, starts feeling as though her body is becoming separate from her self. Marian endows food with human qualities causing her to identify with them and thus, discovers she is unable to eat. The Edible Woman is an intriguing novel and I feel perhaps I could judge it better if I returned to the book at a later date. I love Margaret Atwood (especially The Handmaid's Tale) but I haven't gotten round to reading this one yet, I'll have to check it out. ha. this also is on my reading list! This book looks very interesting, I try my best to shop locally and by local produce, it's hard though in the winter months middle of Canada human things you can buy army and local eggs. I'd recommend reading about local produce; I buy a lot from farmer's markets BUT you have to buy seasonally AND avoid buying crops that have been grown using extra fuel in order to get them to market early. I learned a lot about how importing crops can actually be better for the environment and our carbon footprint, than buying local produce that has been grown using extra fuel. It's all so interesting; there are so many decisions that have to be made! I would recommend reading Farmageddon over Eating, it's much more up to date and interesting. Eating is good though. I loved The Handmaid' Tale; The Blind Assassin is AMAZING and I really enjoyed her reworking of a Greek story. She is a phenomenal writer. :"eating". not the atwood. her and i don't quite get along. I read Handmaid's Tale a few years back and wasn't too keen on it either, but it was only years later than I began appreciating the story. Haven't read Edible Woman yet, but that and Blind Assasin have been on my reading list for a while. Wasn't a fan of Penelopiad. Kinda lucky that Atwood lives in my city, and pretty cool that some of my English TAs have seen her at her favourite cafe.